I don’t spend much time thinking about bell ringing or indeed bells but it is quite fascinating stuff. Campanology is one of the oldest forms of communication and certainly the most melodic. When I read in The Tameside Reporter that St George’s Church in Hyde was looking for bell ringers it struck me as the perfect thing to do as a volunteer. A skill that was fun and useful. The only problem is that I have a very big fear of heights. I had once been up a bell tower when I was visiting the Cotswolds and the trip to watch the bell ringers wasn’t too bad it was just the trip to the roof. I remember lying down for most of the time I was meant to be admiring the view. Despite this I went to meet Ann on a Monday night and walked into Jen who I’d met at Operation Farm when I volunteered at the allotment. She looked different without her hat on. I met the other bell ringers and then we made the assent to the bell ropes. The steps were a little steep but thankfully all enclosed and not too many. I reached the little room with ease and sat on a handy bench. The bell ringers prepared the ropes and I watched them ring. It seemed easy in a way but I feared it was more complicated than it looked. The ropes went up and down while Andrew the leader shouted out commands. “2 to 3, 3 to 5”. Were they changing the order? Were some bells playing together? It was hard to tell but the bells were playing a different melody. When they finished playing Andrew commented that it I must have learnt something from my trip up the bell tower in the Cotswolds because my feet were firmly on the floor. A crossed leg so close to moving ropes could have me hanging from the ceiling by the foot. I think this must have been more of a coincidence than anything else. I asked how long it takes to learn and Andrew said it depends on the person but some people had the technique down in 6 weeks and others it took much longer. I feared I might be in the longer category. It was now my time to start learning the technique. I had some technical terms under my belt. The end of the rope was the tail and the furry bit you grab is the Sally. My first challenge was to do part of the stroke while Andrew stood on a box to catch the ‘Sally’. I lifted my hands above my head to bring the rope down again and I was surprised that the rope wasn’t heavy. Andrew said “you wouldn’t be able to ring solidly for 5 hours if it was”, indicating a stone commemorating the mammoth ringing session he was referring to. 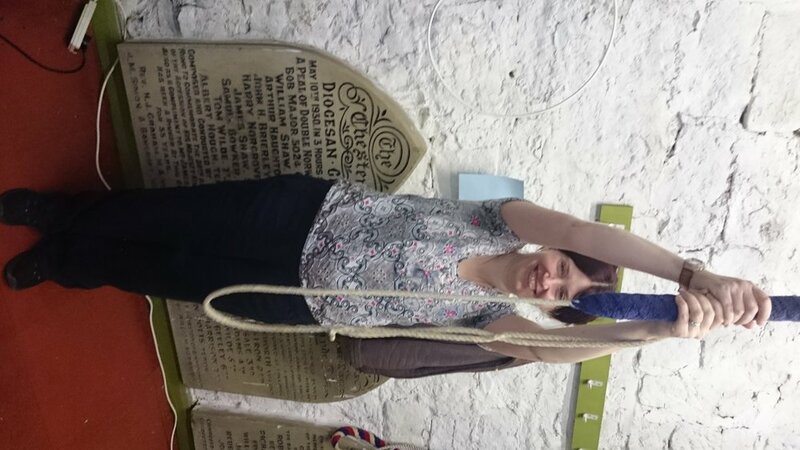 After listening to more of the bell ringing with Matthew, a guest bell ringer from St Marks, calling the changes, I tried a different part of the stroke pulling on the Sally and letting go. This time I got to feel the full weight of the bell and find the tipping point of when the bell was about to fall. It was rather like the biting point on a clutch. Again the bell felt much lighter than I thought it would, a combination of a good mechanism, gravity and momentum. The bells are upright at St George’s, as you pull on the Sally the bell falls and rotates nearly 360 degrees and when you catch and pull the tail the bell swings back to its original position. After listening to the bells for a final time we went and had tea and biscuits. I was told that sometimes they have cake. Andrew explained that the calls of ‘3 to 5’ were to change the order of the bells to adjust the melody. I was very surprised to discover that 3 of the bell ringers were 80 or soon to be in the next couple of years. They absolutely didn’t look it. Bell ringing must keep you young. They had started bell ringing again at St Georges for the Millennium and met at least every Sunday to ring the bells and practise every Monday evening. Brian and Ann even go on bell ringing trips and holidays to ring bells all over the country. The bell ringers haven’t got rid of me yet. I will be returning to learn more. I thought it was really good fun. There are many churches across Tameside that are in need of bell ringers and I urge you if you have the slightest desire to try it to have a go and who knows a whole new hobby may arise. I certainly will never look at a bell tower in the same way again. The bell ringers meet at 7.30pm at St George’s Church Hyde contact Ann on 07816457653 for further information.